Early spring months, for those of us who enjoy water activities are a time our thoughts turn to boating. Plans for fishing trips, cruises and family outings fill our minds and will soon become reality. What better time to give the boat a good check over and replace or repair items questionable at the end of last season? I recommend a complete examination for boats of all sizes, from small inland runabouts to big Great Lakes cruisers. Small vessels should be checked even though their intended use will be only for outings on a pond. Check for cracks or soft areas in the transom. These signs can lead to major problems. Check oars for cracks; they are usually visible once they dry out. If you find them, chances are they will break in the near future. If your vessel is aluminum, look for loose rivets or cracks in the metal. Check seating fixtures or solid seats for loose fittings or deteriorated bases. Larger vessels with outboard motors require a close check of steering cables and connections as well as fluid levels. Make sure the steering runs smooth. If there are stiff or sticky spots in the steering operation, correcting it prior to operating the boat could avoid major problems during the boating season. 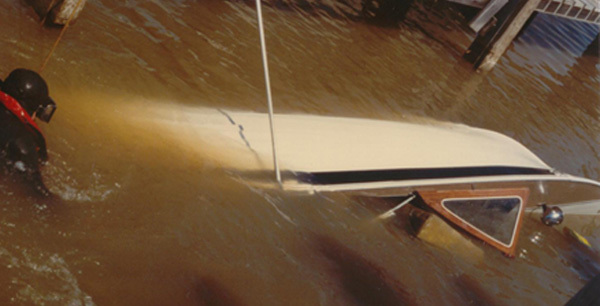 A good steering check should be done on boats of all sizes, inboard, I/O or outboard. On inboard/outboards, be sure to check around the transom boot, if cracks are detected, replace the boot. This may not be an easy task but it could avoid the vessel flooding, even sinking at the dock or underway. Fittings should also be checked on all size vessels. Bow eyes, cleats, chocks, stanchions and rails can work loose as you operate your boat. These fittings are much easier to tighten or replace if needed while preparing for the boating season. A close inspection may reveal cracks around the base of a fitting and indicate the need for backing to avoid it’s pulling through the hull when under a heavy strain. Pre-season examination is a good time to change fuel filters and water separators. These items are very inexpensive to replace and doing so may prevent a loss of power at sea. When checking fuel lines, look closely to be sure they are not rubbing or flexing to the point of possible fracture. In the case of rubber fuel lines, cracking from drying out is a sign to look for. A good look at your wiring is a smart pre-season undertaking. Electronics may have been added and connections made with poor splices or cheap connectors. Failure of equipment, draining of the battery or even a fire may be the result. The recommended splice is a solid connection such as one soldered and sealed with shrink-wrap. Larger vessels with cabins and multiple storage areas require a good deal more time inspecting. Look for signs of mold in closed areas, lube hinges and clean window tracks. All boats with canvas enclosures or covers have fasteners. The most common is the snap-type. Lubricating the inside of the snap can save the material from tearing or pulling the fitting loose. Perform this action with care to avoid discoloration or damage to the material. Checking around windshields, windows and hatches may reveal a need to clean or replace seals. “Anything that can go wrong – will!"